Lake Pleasant Regional Park is a large outdoors recreation area straddling the Maricopa and Yavapai county border northwest of Phoenix, Arizona. The park is located within the municipal boundaries of Peoria, Arizona, and serves as a major recreation hub for the northwest Phoenix metropolitan area. The cornerstone of the park is the 10,000 acre (40 km² or 15.6 mi²), Lake Pleasant, one of the important artificial reservoirs surrounding the Phoenix metropolitan area. Created by the Waddell (Pleasant) Dam, which was finished in 1927, the lake originally had a surface area of 3,700 acres (15 km² or 5.8 mi²) and served as a private irrigation project. At 76 feet (23 m) high and 2,160 feet (658 m) long, the original Waddell Dam was, at its completion, the largest agricultural dam project in the world. The lake was filled by the Agua Fria River, capturing a large watershed throughout Yavapai County. Construction of the Central Arizona Project Aqueduct, which began in 1973, soon diverted water from the Colorado River to the lake, converting the lake from an agricultural project into a storage reservoir for the project. Completed in 1994, the New Waddell Dam tripled the surface area of the lake, submerging the old dam beneath its waters. Shortly after the completion of the dam, the area experienced a prolonged drought, and while the lake grew considerably it would not reach full capacity until early 2005. Although still fed by the Agua Fria River, the CAP aqueduct is the primary source of water for the reservoir. 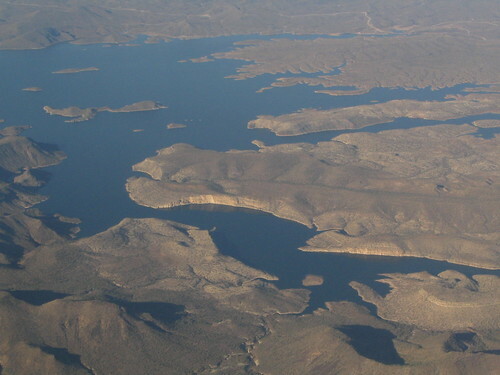 Lake Pleasant is used as a major water sports recreation center for the Phoenix metro area, as well as serving as an important storage reservoir for the rapidly growing region. A number of boat docks and beach access make the lake a popular destination for scuba diving, water skiing, jet skiing, sailing, windsurfing and other water sports.